CANADA. Commercial Bank of Canada. 1 Dollar, 1860. CH# 155121202. PMG Choice Fine 15.Plate Position D. Serial Number 23564. Hand Signed by J. Davidson. This extremely scarce piece is the first we have seen or handled for the type. According to the Charlton Book, this note is only known in an Institutional Collection. 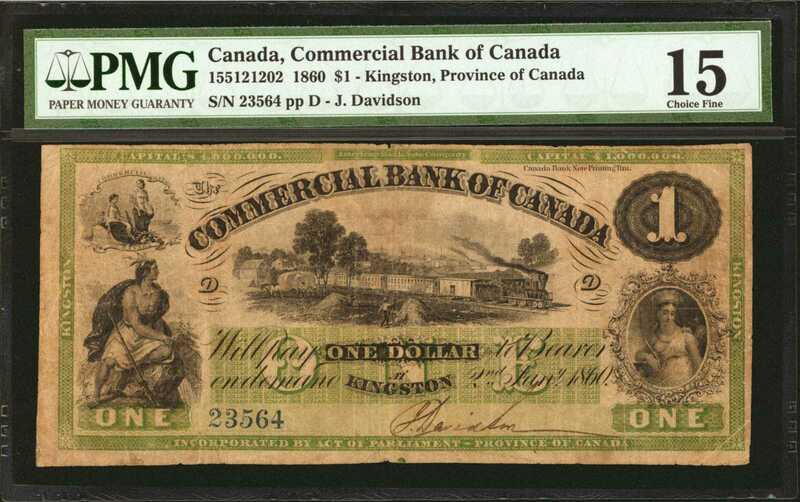 The PMG pop report does show this note being the finest, with only one other piece graded and we therefore believe that it is one of only 2 known in private hands. <p>The note itself shows with even wear and just some minor edge fraying which is to be expected at this grade level, and on issued pieces of this age. The design pictures A bank Crest at upper left, and a seated Indian with a rifle at lower left. A train and hay field is pictured at center below the bank name, with an Indian Maiden in the oval vignette at the bottom right in between the upper and lower obligations. The reverse of the note is blank. This piece has deep blank inks, with green undertones, and a green border with Kingston printed in the border design at the left and right margins.PMG Choice Fine 15.